It hasn't been pretty for Seattle Mariners fans in recent years. The late 1990s and early part of the new millennium saw greats like Ken Griffey Jr, Randy Johnson, Edgar Martinez, Alex Rodriguez and Ichiro Suzuki suit up for the team. Since then, it has been a lot tougher. But things are looking better. Taijuan Walker has been regarded as not only the team's top pitching prospect but a future potential ace. Collectors already have plenty of Taijuan Walker cards to chase including autographs and rare inserts. The Mariners picked Walker in the first round of the 2010 draft. Taken out of high school, he had just turned 21 a couple of weeks before Seattle added him to the big league roster three years later. Standing 6' 4", the starter has an impressive four-pitch arsenal that includes a mid-90s fastball. 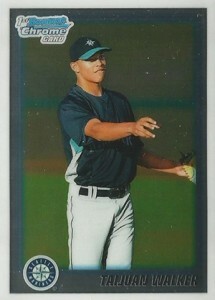 The first Taijuan Walker cards came out in 2010. He's also has autographs in 2012 and 2013 sets. Because of his late-season call-up, it likely means that his first official rookie cards will be found in 2014 sets. That said, his early prospect cards, which are inserts by technicality, will be some of his most popular. There's always some risk when it comes to collecting pitching prospects. They are more prone to major injuries that derail their careers. Also, playing for the Mariners is likely to mean a little less mainstream attention and hype. That's not all bad, though, as it has helped keep prices somewhat reasonable. If the Mariners can get some offensive help, things should turn around quickly for the club. Walker joins a rotation that's anchored by Felix Hernandez, one of baseball's most dominant pitchers. Not far behind Walker are several top pitching prospects that could help Seattle have one of the best pitching staffs in baseball within a few years. Below are some of the most important early Taijuan Walker cards released before his major league debut. For a lot of collectors, the first Bowman Chrome card of a player is the new rookie card. 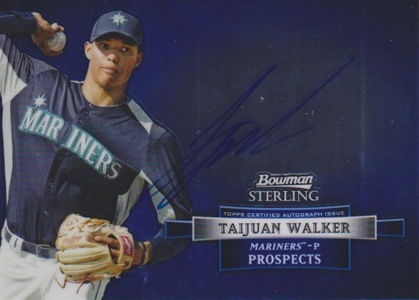 Released just a few months after being drafted, the 2010 Bowman Chrome Draft Taijuan Walker is part of the Prospects insert set. It features him as a member of the Mariners but it doesn't have a signed version. The card is cheap so it's worth spending the small premium over the base Bowman version, even for those on small budgets. As usual for Bowman Chrome, there are plenty of Refractor parallels to keep collectors busy. The 2010 Bowman Sterling Taijuan Walker autograph is important because it's his first signed card in a major league uniform. Although Sterling doesn't have the same prestige as Chrome, it's the only option from 2010. There's also that pesky sticker. That said, it's still the first and down the line, this should be one the most coveted Taijuan Walker cards. 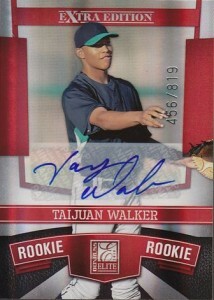 Taijuan Walker had another autograph released in 2010, although it's not licensed. 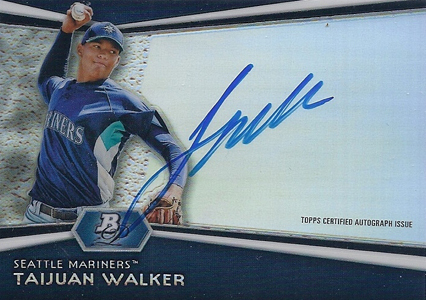 The 2010 Elite Extra Edition Taijuan Walker autograph comes numbered to819. It has several levels of low-numbered parallels, some signed and some not. Elite Extra Edition is a long-standing brand in the hobby, so even without logos, it still carries very solid values. After not having any autographs in 2011 sets, Topps used the prospect in a couple of 2012 Bowman-branded sets. The 2012 Bowman Platinum design is very clean. The big highlight is the on-card signature. Seeing as how he has signed cards in earlier sets, this one may present itself as a slightly more affordable alternative for those not concerned about having what's first. 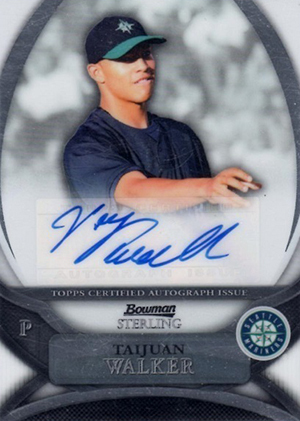 The 2012 Bowman Sterling Taijua Walker autograph falls under a similar category as the Platinum card. Despite coming from a high-end brand, autographs are very plentiful in the set. As a result, this one doesn't run too high. Like other Bowman sets, there are several Refractor parallels.